Lexus Toyota auxiliary audio input interface, for iPhone Mp3 player, satellite radio, DVD player, or any external portable audio device. Pie TOY03-AUX converts the satellite radio or CD-changer port of the Lexus Radio into a stereo auxiliary input. The audio input created can be used for connection of a digital media player (iPod, MP3, etc. ), portable satellite unit, DVD, or game system, without the need for FM modulators or transmitters. The TOY03-AUX can work in one of two modes (depending on what the factory radio is capable of) providing greater flexibility and vehicle coverage. The TOY03-AUX can be configured to work with CD-changer or satellite mode, allowing retention of any existing factory installed accessories such as navigation, rear seat DVD, CD-changer, or satellite radio. no charging or controls Auxiliary audio input adapter. Toyota Radio must have external CD-changer capabilities. Compatible with factory navigation radios. 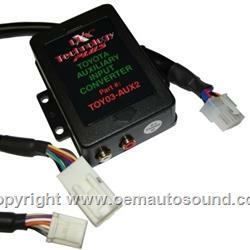 The TOY03-AUX converts the satellite radio or CD-changer port of the factory radio into a stereo auxiliary input. Without the need for FM modulators or transmitters. The TOY03-AUX2can work in one of two modes (depending on what the factory radio is capable of) providing greater flexibility and vehicle coverage. great interface for Toyota radios, no other one has come close to this for the price, and frankly, I can't find any faults with this. A lot of other devices on the market I've tested have had numerous problems. + No low humming or whining sounds when driving at any speed, or when shifting gears. + solidly build. Don't have to worry about the circuits popping out or getting damaged + Good form factor if you are looking + Been working solidly for over half a year, without any issues.